welcome! Are you having a spell of bad luck? Sometimes it seems as though we just can't get ahead. This is a very handy mojo indeed. Handed down in my family for over two centuries, this lucky mojo is the real deal, and I have packed it full of lucky items just for you! Open roads and reverse your bad luck now! Great for getting good outcomes in court cases too. 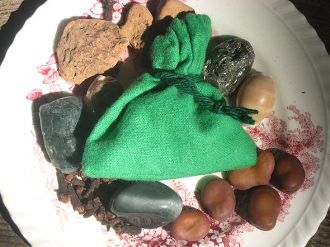 Created with lodestone, iron filings, high john the conqueror root, a coin from Ogun's pot, mexican anil, conjure weed dirt, mojo bean, devil's shoestring, cowrie shells, calendula petals and a few more lucky talismans for good measure! Add three of your fingernail parings to charge it to work for you. Use this mojo anyway you see fit- on your altar, on your body, at the front door to you home, or in your car or work place. It's up to you, and so is your future. Your mojo should be anointed or fed regularly with a suitable oil. I have many anointing oils here in my shop that would be very compatible with this mojo such as Danda, High John, Has No Hanna, Shi Shi, or Van Van. Mojo colour will vary. Yours may not look like the photo. thanks for looking!